Ailihen is a great brand of fun and functional electronics products. These headphones are no exception. Thoroughly enjoyable to use, these are so lightweight and soft on the ears. Often enough these kinds of headphones are so uncomfortable that people opt for earbuds that can be even worse for you, but that’s not the case with these. Because of the leather and ergonomic design, they feel like almost nothing on the ears. The sound quality of the Ailihen I35 Stereo Foldable Headphones is superior to many of the competing brands of headphones in this price range. The quality of this product is more than worth the budget friendly price with multiple functions and compatible with many phones as well as laptops and computers. This product has received lots of high-level ratings from other buyers as well as professional product reviewers. The sound quality is surprisingly amazing. The bass is prominent but not overbearing, and you don’t hear all the other sound that is going on around you because of the sound canceling capabilities. You can easily just get lost in your own world with these headphones on, and not be interrupted by what is going on around you. The experience with these is truly amazing. The Ailihen I35 Stereo Foldable Headphones probably have the best sound quality for this price. You might forget that you are even wearing headphones because the sound is just that clear. The coolest thing about these headphones other than the look is the range of features that it has. It’s a blessing to be able to pause or start music, especially if you get a call. The 360-degree pickup capabilities of the microphone lets you have some high-quality voice calls should you choose to talk to someone. With this quality sound, you’d rather be talking with your friends by voice rather than texting. There is a function right on them that allow you to answer and end those phone calls. 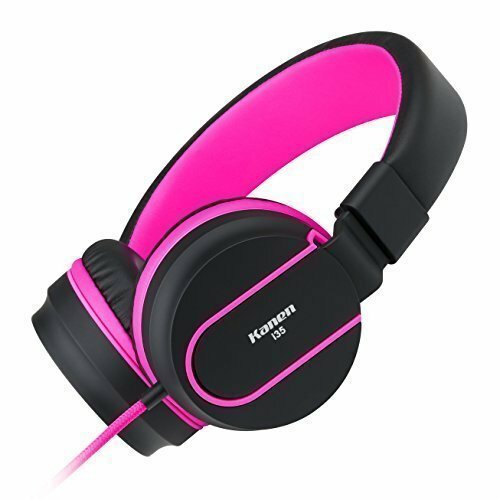 These headphones are so beautifully made with a super soft and comfortable exterior and totally modern colors. This is the kind of unique headphone that is sure to capture the attention of all those around you. Ailihen I35 Stereo Foldable Headphones is compatible with all Android phones as well as Blackberry and other types of phones. They are so lightweight at 11.2 ounces that you can carry them around in your purse or backpack without any trouble, especially since they fold up nicely and can slip into a bag with ease and not take up much room. The cord length of 1.5m is the perfect length to be able to lean back at your desk and not have any tension between you and your laptop. The band is also easily adjustable to fit any head. You know the annoying feeling of headphones being too wide that they slip off or so small that they don’t reach your ears? You won’t experience any of that with these. Everyone Can Appreciate These Headphones. These headphones are for the tech geek as well as the fashion-conscious. Really, they are for everyone who loves listening to music or watching TV on any and all devices. Even kids will appreciate the softness, the colors, and the amazing sound capabilities of the Ailihen I35 Stereo Foldable Headphones. Adults will be glad that they can answer and end their phone calls right from the headphones and kids will love the fun colors and being able to be completely immersed in their music or video games. Especially since the headband is adjustable, these headphones are perfect for any head- small children’s heads or adult heads. Once you try these headphones, you won’t want to use anything else. They are lightweight and high quality, especially at this price point. They work well for anyone who is looking for a modern and fun design with lots of capabilities including a 360-degree pickup microphone and start/stop features for both your music and your phone calls. What makes these great is also that they fold up well so that they don’t take up much space anywhere that you want to put them. The best feature of the Ailihen I35 Stereo Foldable Headphones is perhaps the ergonomic design that allows it to sit on your head and against your ears without any discomfort while you listen to your music or have your phone conversations, and the adjustable headband is a huge plus.